One of the more influential characters in Ukrainian history, Bohdan Khmelnytsky may be viewed alternately as a hero or a villain, depending on ones’ historical perspective. Some accounts portray Khmelnytsky as a great leader and statesman, while others view him as a figure who left only destruction in his wake. This much is true: Khmelnytsky was leader, from 1648-1657, of the Zaporozhian Cossacks who organized an uprising against Polish rule in Ukraine, which ultimately led to the transfer of the Ukrainian lands east of the Dnieper River from Polish to Russian control. So, what is Bohdan Khmelnytsky’s connection to the town of Tluste, apart from the fact that his imposing statue now overlooks a small park on Hrushevskoho Str. on the plot of land where the villa of Baron Hirsch once stood? “Mykhaylo Khmelnytskyy once lived in Tovste castle, and he probably reconstructed and enlarged it after enemy attacks. From other sources, it is known that he was engaged in military campaigns. Mykhaylo Khmelnytskyy came from the well-known rich boyar family of Venzhyk Khmelnytskyy. This fact is confirmed by the coat-of-arms. He was married to Anastasiya, who was a daughter of Cossack Hetman Fedir Bohdan. The couple had only one son, Zinoviy Khmelnytsyy, who was given another name at christening – Bohdan. Mykhaylo Khmelnytskyy was turned out of the town because of a crime of unknown description. Most probably this happened because he was an organizer of a peasants’ uprising, the first one of which took place in 1591. At the time, Ukrainian peasants were fighting against Polish landlords in Kyiv, Podillya, and Volyn. As the original Ukrainian version of the text concerning Mykhaylo Khmelnytsky is much longer and more detailed (including references) than the brief summary above, it would be informative to investigate and substantiate this claim more thoroughly. “Although he had been educated in Poland and had served with Polish military forces against the Turks, Khmelnytsky, who had become chief of the Cossacks at Czyhryn, quarreled with the Polish governor of that region and was forced to flee (in December 1647) to the fortress of the Zaporozhian Cossacks, a semi-military community that had developed from runaway serfs, bandits, and traders who had settled along the Dnieper River. He then organized a rebellion among the Zaporozhian Cossacks and, with the support of the Crimean Tatars, marched against the Poles in April 1648. His victorious advance won him additional support from the dissatisfied peasants, townspeople, and clergy of Ukraine, who joined him in a mass uprising that enabled him to enter Poland proper and seize Lwów (now Lviv) in October 1648. After winning more victories in 1649, Khmelnytsky made peace with the new Polish king John Casimir, concluding the Compact of Zborów (Aug. 18, 1649); its terms permitted him to establish a virtually independent Cossack principality in Ukraine. The treaty satisfied neither the Polish gentry nor Khmelnytsky's followers, many of whom remained subject to Polish landlords; therefore, he renewed the war in the spring of 1651 but was defeated at the Battle of Beresteczko in June and was compelled to accept a new, less advantageous treaty. He then sought aid from Moscow against Poland and in 1654 directed his Cossacks to take an oath of allegiance to Alexis, the tsar of Russia. The Russians subsequently invaded Poland, but Khmelnytsky, not content with his pact with Alexis, entered into secret negotiations with Sweden, which was also at war with Poland. He was about to conclude a treaty with the Swedes, placing the Cossacks under Swedish rule, when he died [in 1657]. This description of Bohdan Khmelnytsky’s military exploits provides little information about the nature of the popular uprising nor its consequences, whereas it is widely acknowledged elsewhere that many Jews were killed during the course of the rebellion. Indeed, after detailed analysis, Stampfer contends that as many as 18,000-20,000 Jews died out of a population of 40,000; an immense number even if it is much lower than many previous estimates (5). And what was the role of Bohdan Khmelnytsky, the leader of the uprising, in the greater scheme of things? It is reported that “Khmelnytsky told the people that the Poles had sold them as slaves ‘into the hands of the accursed Jews’. 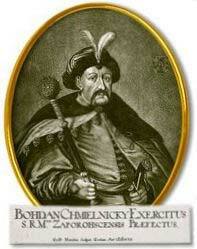 With this as their battle-cry, the Cossacks killed a large number of Jews during the years 1648–1649” (10). If his instigation were intentional and the direct cause for great numbers of people to be killed, it is of course understandable that he should be reviled by the Jewish community for having inflicted so much suffering. In the end the facts speak for themselves and it is left for current and future generations to interpret them. (1) Sysyn, F.E. “The Khmel’nyts’kyi Uprising: A characterization of the Ukrainian revolt”. Jewish History 17: 115-139, 2003. p. 130. (2) Pawlyk, J. History of Tovste. Chortkiv, 2000. p. 27-30, and pers. comm. (3) Free Essays.cc. Hetman Bohdan Khmelnytsky; http://www.freeessays.cc/db/26/hal52.shtml; last accessed on 31 August 2005. (4) Encyclopedia Britannica 2003 Deluxe Edition CD-ROM. (5) Stampfer, S. “What actually happened to the Jews of Ukraine in 1648?”. Jewish History 17: 207-227, 2003. p. 218. (6) Rosman, M.J. Founder of Hasidism: a Quest for the Historical Ba’al Shem Tov. Berkeley, 1996. p. 45. (7) Wikipedia, the free encyclopedia. Bohdan Khmelnytsky. http://en.wikipedia.org/wiki/Bohdan_Chmielnicki; last accessed on 31 August 2005. (8) Sysyn, F.E. “The Khmel’nyts’kyi Uprising: A characterization of the Ukrainian revolt”. Jewish History 17: 115-139, 2003. pp. 132-33. (9) Kohut, Z. “The Khmelnytsky Uprising, the image of Jews, and the shaping of Ukrainian historical memory”. Jewish History 17: 141-163, 2003. p.142. (10) Wikipedia, the free encyclopedia. Bohdan Khmelnytsky. http://en.wikipedia.org/wiki/Bohdan_Chmielnicki; last accessed on 31 August 2005. (11) Stampfer, S. “What actually happened to the Jews of Ukraine in 1648?”. Jewish History 17: 207-227, 2003. p. 221. (12) Wikipedia, the free encyclopedia. Bohdan Khmelnytsky. http://en.wikipedia.org/wiki/Bohdan_Chmielnicki; last accessed on 31 August 2005. (13) Kohut, Z. “The Khmelnytsky Uprising, the image of Jews, and the shaping of Ukrainian historical memory”. Jewish History 17: 141-163, 2003. p.141.